Recording and scanning big TV files for commercials hits a drive really hard. Having at least two physical drives separates the bandwidth necessary to keep the user interface (UI) responsive and minimize the risk for glitches during recording and playback. 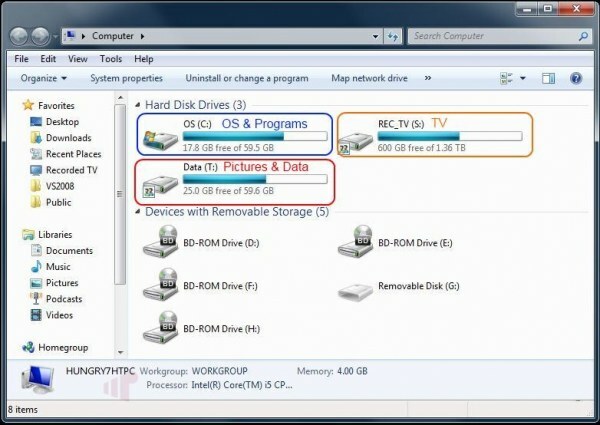 After adding up all the traffic caused by Media Center recording and ShowAnalyzer reading back and forth in the file while you try to watch it (all potentially multiplied by the number of tuners); then add in a couple “extenders” – you’ll be glad you put the operating system (OS) on one disk and recordings on another. I’m sure there will be some disagreement on this one so it is important to understand context. If you only want to store DVDs and other “light” media a green drive will work fine. That said, I’ve had horrible results streaming really “heavy” (20GB+) files off of them; both locally and over the network especially in multi-user (i.e. two clients hitting the same drive at the same time) scenarios. Green drives are cheaper, quieter and use less power (what makes them “Green”) because they are slower, but they are not much cheaper, quieter or greener than a 7200RPM that will serve those heavy files without glitches. 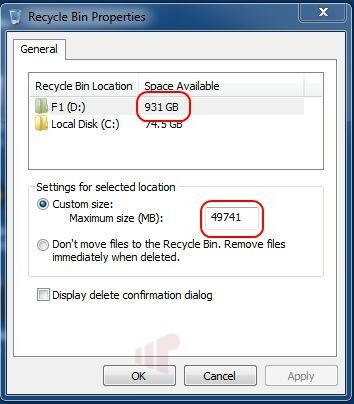 By default Windows wastes a big chunk of space for the Recycle Bin; almost 50GB on a 1TB drive. Since you’re only using your big drives for recording or storing large files, the bin isn’t going to get much use. Why not free that space up for a few more hours of HD. Some argue that an HTPC doesn’t need AV, but I think every PC should have it just in case. That said, it doesn’t mean you need to scan that 12GB recording of “American Idol” every time it hits and leaves the disk. If you have #1 down go ahead and exclude the whole drive, otherwise just add the folder. If you’ve used a PC long enough, you know that someday the power will go out, and that will do bad, bad things to your HTPC. A UPS not only gives you some breathing room for short dips and drops, but most can hibernate or shut down the PC cleanly after a few minutes of power loss. They are an easy thing to forget, and good ones aren’t cheap – but neither is replacing the hard drive (or the files on it) when yours “parks” prematurely. If you only have one HTPC connected to a single TV you can skip this one, but anyone with two or more needs to keep reading. That router you grabbed from the clearance bin at Fry’s isn’t going to play nice with the Blu-ray rips streaming around the house. Many mid-to-high end consumer routers have good built-in switches, but I prefer adding a dedicated 1Gb switch with decent spec’s (large memory buffer, jumbo frame support, etc.) to isolate media traffic from the rest. Having decent hardware is even more important if devices on the network operate at different speeds (PC at 1Gb, extenders at 100Mb); where features like flow control can make a huge difference. Active PFC keeps the supply of electricity more constant while also increasing efficiency (got to get that green back somewhere :)). PSUs with active PFC are a bit more expensive, but it’s well worth it – your components will thank you. Newer power supplies have begun using the logo of “80+” to signify that they are at a minimum 80% efficient power supplies, which is a good place to start. Don’t underestimate the importance of spending a bit more on the power supply either. Just like the router, a $20 PSU is very appealing until it destroys everything (and they smell really bad when they burn up). I’ve found the sweet spot on an HTPC to be somewhere between two and four GB. Most modern systems are dual-channel so you’re best off running a matched DIMM kit (2x1GB or 2x2GB). RAM is cheap, and we all know x64 is the future, so even though you can’t use .7GB of the four on x86 I always buy 4GB kits – it will be there when x64 can finally make its case ;). RAM speed is somewhat important, but it is critical to know what your system supports and how forgiving it is when it comes to voltage. Many mainstream systems max out at DDR3-1333, so in that case paying more for some DDR3-1666 memory probably isn’t going to improve your HTPC-performance, and can cause compatibly issues if the vendor requires out-of-spec voltage (more that 1.5V) to get the extra speed. The jury’s still out on how useful heat spreaders are for mainstream RAM; my viewpoint is as long as they are reasonably sized (so they don’t cause installation issues) it can’t hurt. If the HTPC is out in the open, get a nice wireless one (Editor’s Note: Dinovo Mini is the best if you can afford it). As much as we like to pretend that the HTPC is a piece of CE kit, it’s not (our secret) – so that keyboard will get some use from time to time. Spend a couple bucks to make it convenient; sitting on the floor with a wired keyboard puts a wicked kink in the neck. That said, know your surroundings–if you know your dog or child is going to destroy it, don’t spend $100 on one. There are plenty of effective, albeit less exotic, $40 keyboards out there to do the job. Electronics are not investments – approach your depreciating asset from the right perspective. Think about how much more you can do with a modern HTPC compared to one that is even two years old. Unfortunately, HTPCs depreciate faster than most CE devices, like a TV, buying at the middle makes it easier to replace parts more frequently. Points 3 and 4 were somethings, I didn’t think about. I’ve also been looking into getting a new power supply so an uninterrupted one is what i’ll be looking into. There, I fixed it for you. I know that this a blog and I don’t want to be a grammar police. But I found that it is difficult to read through it with all the grammar errors. Can you please proof-read your “articles” before posting? Thank you for your hard work. If you’ve used a PC long enough, you know that someday the power will go out, and that will do bad, bad things to your HTPC. Not only an UPS gives you some breathing room for short dips and drops, but also most can hibernate or shut down the PC cleanly after a few minutes of power loss. UPS’s are things to forget, and good ones aren’t cheap – but neither is replacing the hard drive (nor the files on it) when yours “parks” prematurely. I have to totally agree with all your comments. I guess you will go into more detail for the more experienced HTPC builder. A few comments questions though. I was listening to the ent2.0 podcast. Good work! 1. UPS – So I have a UPS, but what is the best way to wake up the device after a long power outtage. My UPS will initiate a hibernate, but how do I get the UPS to wake up the PC to record. 2. Can you suggest a good network switch that also passes WOL. Liek you suggested all 1Gbit switches, but the 360 at 100Mbits has some minor issues (which I think are network related). 3. Power states and CableCard and DTA. I usually have to cycle power on the ATI OCUR cable card. Haven’t really spent time to figure out why. Buy can you talk about how to use the pwoer states to wake the PC, make the PC sleep when not in use and upon waking, the PC CableCard to work. When I was using only Clear QAM/ NTSC tuners, this was no problem, but I haven’t been so lucky with OCUR. 4. HD’s. I use green HD’s for movie backups and most other media (except recorded TV). You are correct, multiple extenders seems to be more problematic. Invested in a WD black and very happy. What is peculiar though is recording usually never has issues, but playback is the problem. I though reading is faster than writting. There are instances when four shows are recording at once, and the playback is choppy. Just your thoughts. 1. The PC will shutdown gracefully, but it won’t power up by itself. You would need to go through normal channels to turn on. 2. Any switch can pass magic packets for WOL. 3. S3 is what I find to be the best power state to use for HTPC. It uses minimal power when sleeping and resumes quickly. With a Ceton card, S3 poses no problem so this must be some type of issue with the ATI driver/hardware. 4. It’s not about raw read speed. When reading multiple files, you are asking the mechanical hard drive head to move from place to place (seek) and that is the problem. If the spindle speeds up, the seek access is faster. If you use hibernate, it should automatically wake up for recordings provided the system supports it. I have a Dell PowerConnect 2808 which works brilliantly; it’s not cheap though. MS recommends the Netgear GS116 to custom installers, you might be good with the lower-end of that family (GS108, etc). That’s a know issue with the ATI cards. I remember seeing a work around (maybe net stop/start ehRecvr on resume), but I don’t remember offhand what it was. I’d guess that the playback mechanism doesn’t buffer enough to mask the I/O issues, where the SBE is very intelligent about writing data. It also might be worth noting that when formatting a media drive for “heavy” files, you can set the cluster size to the max (64k) which will give some performance gain to drive. It may not solve all or any of your issues, but it is something that I do to get a bit better performance. It is important to understand that if you have a lot of files smaller than the cluster size to store on a drive, then this will result in wasted space. This is why I only do it for media drives. I’ll echo the recommendation on the Dell PowerConnect 2808. Below is three network switches I generally recommend. And I highly recommend spending more on a good switch. It is one of the most overlooked components in a connected home and one of the most important. Next up, the Dell PowerConnect. Easy to use and performs very well. And finally the Pakedge–very good switch and a few different Gigabit switches to pick from. They are not available to purchase retail but you can find them from installers and Fluid Digital carries them. Minor update. The unmanaged HP switches I liked have been updated to the 1410 family. Great blog, it actually reminded me to check my virus exclusions. And as for the grammer corrections by allston232, where they said “An UPS “was correct over “A UPS”, how wrong they were, and it’s more than just a bit embarrasing for them. you should still use A (as the blog did) , if the word begins with a U or O and the u makes the same sound as the y in you, or o makes the same sound as w in won, then a is used. Thanks for all the suggestions. Can’t wait for advanced guide and next podcast. Now, I hope that the cable card (HD) HomeRun will be available soon. It mentions the article is for beginners but I’ve been building and playing with HTPC’s for about 6 years and I learned a thing or two. Thanks for a great article.